A while back, Gerald Cameron created a great list of games that use the traditional board and stones to play the ancient game Go. It's hard to beat the alluring minimalism of a traditional go set. Go's components are the proverbial blank slate for a game designer, so it's no wonder there are quite a few Go variants and original games available. 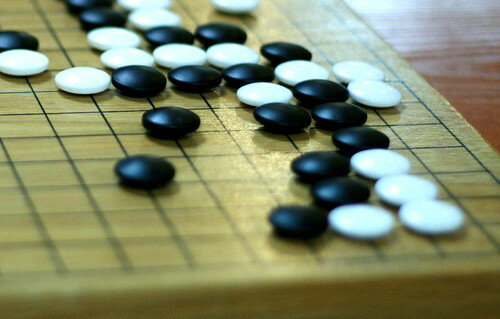 Go is a great example of a thousand-year game. This list is how it shows a long-lasting classic game often inspires derivations. Those offshoots help keep the parent game alive by using the same components. They also often introduce individual elements of the parent game, thus becoming a teaching tool for strategy and tactics. What could you design within the constraints of a 19x19 grid, 181 black stones, 180 white stones, and a couple bowls? Are there any games that use pieces like this that begin with the board filled (randomly, or in a specific configuration), and then the gameplay revolves around existing pieces being removed? It doesn't use a Go-Ban, but Campos involves placing tiles down on the table until no tiles are left, then removing tiles until the table is clear. You score points by playing "Scoring Cards." Each card says something like "Score X points if there are more blues than yellows." The timing of a scoring card is critical and adds a lot to play. Conway's game has no out of bounds, so formations can simply fly across the board as it goes on to infinity, so this game might need rules to cover situations that occur in corners and along walls. Actually, I hadn't seen this simulation before, so thank you for linking to it! It definitely gives me some ideas to tinker with in the future. Generally, if I use "if/then" conditional rules in abstract board games, they're very minimal. It's easy for a computer to keep track of every condition across the board, but harder for humans. oh really? You never heard of Life? I guess maybe I am dating myself but it got some pub back in the very early 70s when all we had was scientific american magazine and such. Supposedly, people who had access to the primitive computers back then (this is like even before the pocket calculators) would program initial set ups into a pc and then hit a return for each iteration. His other famous game is sprouts. Have you seen that? It is played with pencil and paper and there is no solution to it, as far as I know. A couple of games spring to mind where you have to remove stones/pawns. One is by Cameron Brown who wrote a remarkable book on connection games, the book is like 500 pages? I mean it is an epic. Here is a link to his game: Limit where you move a pawn and then remove a tile and also remove your opponents pawn if it has not "freedoms" I.e. e.g. Go. you can basically make your own Dvonn set with two sets of colored Legos, and a board of tesselated hexagons. It's worth trying. Note Dvonn is part of a set of games, created by Kris burm, called the Gipf project which remarkably all those games have recieved critical acclaim. Dvonn is the only one I've played with regularity; the others are interesting too.